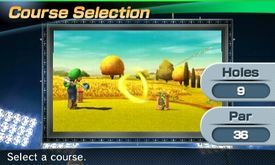 Gold Links is a golf course in Mario Sports Superstars. As its name suggests, the course is a links-style course, like the Links course from Mario Golf on the Game Boy Color and Mario Golf: Advance Tour on the Game Boy Advance. The course features Fast Fairways, Heath, Bunkers and occasionally buildings. The course is used in the Flower Cup. Hole 1 Par 4 386 yards 423 yards 454 yards A straight hole that features two fast fairways, two bunkers and heath surrounding the left side of the course. Hole 2 Par 4 378 yards 399 yards 423 yards A hole that curves to the left with heath surrounding both sides of the course and has four bunkers on the fairway and two near the green along with two fast fairways. Hole 3 Par 3 208 yards 220 yards 236 yards A short hole with four bunkers behind the green and a single fast fairway. Hole 4 Par 5 491 yards 519 yards 549 yards A longer hole that curves slightly to the left with six round bunkers throughout the fairway, a long singular strip of fast fairway and numerous heath patches. Hole 5 Par 4 364 yards 397 yards 417 yards A hole that curves slightly to the right and has a long strip of fast fairway, two bunkers on the normal fairway and two more bunkers in front of the green, surrounded on both sides by heath. Hole 6 Par 4 335 yards 366 yards 396 yards A straight hole that splits the fairway and has a gap between the green and fairway with heath. Contains many bunkers and a fast fairway. Hole 7 Par 4 397 yards 429 yards 436 yards A hole with a river splitting the fairway in the middle and a fast fairway on each section of the fairway. Contains one bunker on the fairway and two near the green. Hole 8 Par 5 534 yards 563 yards 592 yards A long hole that curves in an "S" shape and goes around multiple buildings on the left side of the fairway and later Heath to the right of the fairway. Contains four fast fairways. Hole 9 Par 3 173 yards 185 yards 192 yards A short hole with the green curving around behind a large circular bunker. This page was last edited on June 2, 2018, at 04:43.